• Take one saucepan and then add ½ cup oil, add ½ kg potato, fry and dish out. 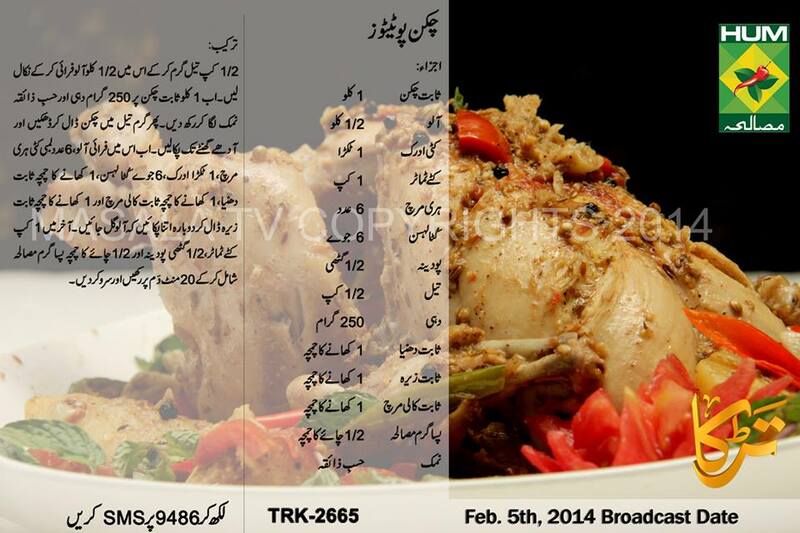 • After this add 1 kg whole chicken, 250 grams yogurt, salt as required. Leave it aside. • Now pour chicken in hot oil and cover. Cook for half an hour. • Also add fried potatoes, 6 long chopped green chilies, 1 piece ginger, 6 cloves chopped garlic, 1 tbsp whole coriander, 1 tbsp whole black pepper, 1 tbsp whole cumin seeds. Cook until the potato gets tender. • In the end add 1 cup tomato, ½ bunch mint leaves, ½ tsp garam masala powder. Cover and cook for 20 minutes and serve well.